Am I a Candidate for Dental Implants in Fort Lauderdale? Are you tired of living with the daily challenges of tooth loss? Invest in your oral health and quality of life with dental implants in Fort Lauderdale. As the only permanent solution to replace missing teeth, you will benefit from an option that offers over a 95% success rate when performed on the ideal candidate. By replacing both the root and crown, you will enjoy a solution that closely looks and functions like a natural tooth. At Mingel Dental, we offer single, multiple, and complete tooth replacement with dental implants. The long-term success of the procedures relies on your candidacy for the treatment. Generally, if you have healthy gums and adequate bone density, you can benefit from dental implants. However, even with bone loss, you can still get them with an additional bone grafting procedure. Medical Conditions: There are some medical conditions that may prevent you from getting dental implants, such as those that limit the body’s ability to heal and fight infections. If you have uncontrolled diabetes, immune disorders, connective tissue disorders, or have previously had radiation to the head or neck, you may need an alternative solution to replace your missing teeth. Medications: Medications that suppress the immune system, like steroids, will decrease your body’s ability to heal after the procedure. In addition, you will have an increased risk for implant failure due to infection. As a result, you may need to change medications prior to undergoing the treatment. Lifestyle Habits: Certain bad habits can increase your risk for implant failure, such grinding of the teeth and smoking. In addition, if you have a history of poor dental hygiene, dental implants may not be right for you. Dental implants cannot be used on pregnant women or those who have not finished growing. During your consultation, we will thoroughly evaluate your health as a whole to ensure the long-term success of the procedure. If you are a candidate for the procedure, we will create a customized treatment plan. To fill the space of a single tooth, an implant post, an abutment, and a dental crown are used to replace the root and crown of the tooth. You can have multiple teeth replaced without having to use an implant for each tooth. A prosthetic is created that is similar to a bridge or partial denture, which is held in place using one or two implant posts. You can also replace an entire arch of teeth. An arch is created that is similar to a traditional denture. 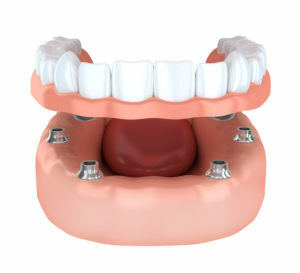 However, instead of using an adhesive to hold it in place, four implant posts are used. With All-on-4 in Fort Lauderdale, you will replace your missing teeth with the only option that closely mimics the appearance and function of natural teeth. Regain a confident, complete smile today. Contact our office to schedule a consultation to see if dental implants are right for you. Comments Off on Am I a Candidate for Dental Implants in Fort Lauderdale?